Anthem® Electronics Blog | News & Updates: MRX 300 earns AVForums.com "Best Buy" Award! MRX 300 earns AVForums.com "Best Buy" Award! "In terms of audio quality, the MRX 300 is a wonderful performer and despite only being rated at 80W per channel, it has plenty of power for any normal room. Anthem's proprietary room correction software (ARC) worked wonders, resulting in a beautifully rendered performance. The MRX 300 brought new life to even very familiar movie soundtracks, with a dynamic and precise delivery and some genuinely impressive bass. The integration of the overall sound field was excellent, whilst the rears had a lively presence that resulted in an immersive surround experience." "If it's pure audio performance you're looking for, then look no further." "The MRX 300 was equally as assured with music, be it multi-channel or stereo, providing a subtle and nuanced performance. When reproducing stereo in particular, there was a transparency to the sound that retained all the detail in the original recordings, whilst delivering them with enthusiasm and genuine insight." "In fact the ability to handle both music and soundtracks makes the MRX 300 one of those rare receivers that works just as well regardless of your listening preferences...if it's pure audio performance you're looking for, then look no further. 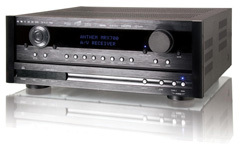 In fact the only receivers offering better performance at this price range have also got Anthem written on the front. A definite Best Buy!" Click here! to read the full Anthem MRX 300 review. Click here! for more information on MRX series receivers.